This solid oak staircase is 60" diameter, with 30 degree treads with balcony rail to match. Handrail is # 237 (2 3/4" x 2 3/8") molded oak; balusters area # 342 (1 3/4" square), two per tread, with 6" spacing between balusters. The treads are a # 142 (1 1/2" thick) and the center column is a 5 1/4" diameter with a custom shape. 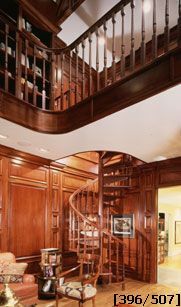 The well rail around the opening at the top is 42" high floor to the top of the rail with balusters spaced 6" on centers. The stair was manufactured at the plant, disassembled and packaged for shipment. The stair was reassembled and wood finish was applied by others.